Zagorochoria - North Pindos National Park is part of the Tentative list of Greece in order to qualify for inclusion in the World Heritage List. This Website currently suggests that Zagorochoria - North Pindos National Park (NP) will be nominated at the 2020 WHC. I can find no evidence for this, and the announcement in Dec 2014 of the intention to go for nomination made no mention of a possible date. However, that uncertainty should not reduce anyone’s interest in visiting it, nor be taken as an indication that it would be any less “worthy” a WHS than many other Cultural Landscapes (CLs) which have gained inscription! We visited in April 2018 and were impressed with what we saw - wishing indeed that we could have given it more time than the half day we had allocated. We travelled by car and targeted 3 aspects - Gorges, Bridges and Villages - but with more time and different interests there is so much more, with fine walking country, flora and fauna, monasteries/churches…. Finally, the 46 “traditional” villages. Based on the title of the intended nomination, they constitute its cultural heart – “Zagorochoria” = Zagori Villages. Whilst, as the UNESCO T List introduction states, “Zagori (“the place behind the mountains”, from the Slavic za “behind” and gora “mountain”) constitutes a distinctive geographic and cultural unit of great architectural and environmental interest”, we felt that they possibly looked a bit “better” from a distance, dotting the hillsides. Close up it was clear that many of them had undergone a fair bit of reconstruction and expansion recently to provide more and more accommodation, restaurants etc, But the planning authority has done a good job in ensuring that the new structures fit in well with the older ones and adopt the traditional rectangular design in stone with loose stone tile roofs. Such signs of economic growth and the, often new, roads hide the fact that the area was left almost entirely empty after the Greek Civil War and suffered from remoteness for many years thereafter. The Zagori area possesses a proud and distinctive culture with an economy in which transhumance was important. There are also significant “intangible” aspects to discover - I suspect we could have gained more value from a longer stay during which we could have investigated such matters! 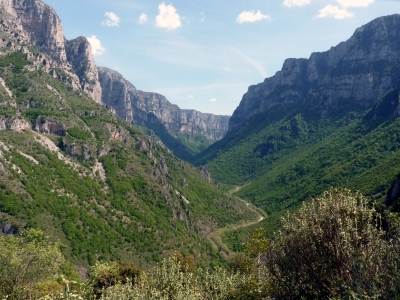 Much of the area likely to be covered by any nomination has already gained inscription as a “UNESCO Global Geopark” (GG) in 2015 under the name of “Vikos – Aoos GG” (Having joined the pre-existing “GG Network” in 2010. Transfer from that onto the UNESCO-badged scheme seems to have been automatic in 2015 and all new sites now become members of both). Currently there are 140 UNESCO GGs and our Connection shows that 21 WHS are, or contain, GG areas. In addition there will be a number of T List sites such as this one. The full situation regarding the overlap between and coexistence of, the GG and WHS schemes is not clear to me. One would think that prior inscription as a UNESCO Geopark should be a good start towards gaining WHS status at least in terms of having adequate Management plans etc. But what about OUV? The criteria for becoming a Geopark are set out in Section 3 of this document and only partly duplicate those for WHS. The issue of whether existing WHS should also become GGs is addressed - but not the other way round! A quick perusal of the dual inscription sites would seem to indicate that perhaps more were WHS before they became GGs than vv. Whilst the prime objective of a GG is to recognise and preserve “Geological Heritage” (“a unified area with a geological heritage of international significance”) it also majors on matters such as sustainable development. At the Aspraggeli NP information center we asked the helpful and knowledgeable ranger if she knew of any intention to gain WHS status in the near future. I am not sure she fully understood the difference between UNESCO “GG” and “WHS” but certainly there was no indication of any involvement of/knowledge by staff at her level in any WH nomination at this point. But we have found such communication “disconnects” between work-face and executive staff are common around the World so that may not be conclusive!